Zero Dark Thirty (military vernacular for 12:30am), is a 2012 historical drama film about the decade-long hunt for and eventual discovery of Osama Bin Laden. The search is led by Maya, the protagonist, who becomes obsessed with her pursuit of the world’s most wanted man. Obviously we all know how this film ends. There are specific features of the capture of Osama Bin Laden that make it so well suited to cinematic adaptation. When Bin Laden was discovered in Pakistan in 2011 and news began to emerge of what happened, the conditions of his death were nearly as surreal as the conclusion of the decade-long manhunt itself. Unlike Saddam Hussein, who in 2006 who was hidden in a “spider hole”, Bin Laden was inside a veritable urban fortress. In the end, Seal Team Six flew in on experimental stealth helicopters and stormed the compound with guns blazing. I’ve heard others make the claim that this film is US foreign policy propaganda, but I see it as just the opposite. Torture has played a significant role in the War on Terror since its inception and it’s depicted in grotesque detail in Zero Dark Thirty, but never glorified. The perpetrators of torture in the film vocally denounce its practice, and they rightly see themselves as doing a job and conducting work that no one wants to do. Torture is a soul destroying craft and it’s presented in exactly this harsh light in Zero Dark Thirty. The tension in this movie is considerable, although having foreknowledge of the conclusion reduces the impact of its delivery. With that said, this film offers just the right amount of visceral action and emotional probing. Creating a movie about 9/11 is a precarious thing because the subject matter carries so much emotional weight. 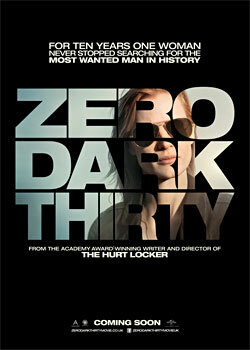 Zero Dark Thirty tells the tale of this dark chapter in our history with remarkable grace and honesty.